NRL players are readying themselves for a State of Origin-esque atmosphere during next year's inaugural Magic Round in Brisbane. All 16 clubs will converge on the Sunshine State in mid-May, with the whole of round nine to be played at Suncorp Stadium for the first time in the game's history. It is one of the highlights of next year's draw, not just for fans but the players as well. 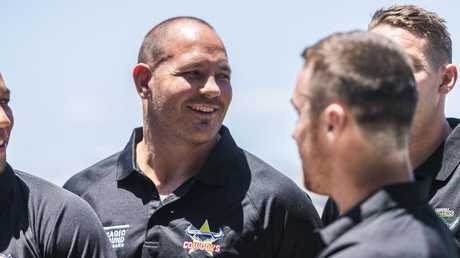 Cowboys veteran Matt Scott has played 15 seasons in the NRL and has not seen anything like this concept before, but is predicting it to be similar to the game's showpiece, State of Origin. The former Queensland forward has played at Suncorp Stadium on numerous occasions and knows Brisbane is ready to host the four-day event. "It will almost be Origin-like with the build-up and the atmosphere," Scott said of the Magic Round. "It's exciting from a player's point of view. I'm looking forward to that buzz around town. "The NRL has shown they have been really forward-thinking over the last few years. They're not trying to change the game but the structure of how it's played. "This is a great addition to the schedule. I've got family that have already bought tickets and are making the trip down (from Townsville) … my brothers will probably spend all four days at Caxton Street. "For a rugby league fan, it's a great experience and what a great place to do it in, in one of the best stadiums in Suncorp." However, while Scott and his North Queensland teammates may embrace playing in their home state, other teams are bracing themselves for the trip into enemy territory. The Gold Coast Titans will open the weekend with a clash against Cronulla on the Thursday before Brisbane meet Manly in the Friday double-header, and North Queensland conclude the round against South Sydney on the Sunday. Manly and NSW forward Jake Trbojevic is familiar with a hostile reception at Suncorp Stadium. He said young players who were not used to playing in front of 40,000-plus crowds would find their match at the Magic Round a galvanising, if not "scary'', experience. The 2018 double-header at Suncorp Stadium - capped by Manly's 38-24 win over Brisbane - drew a 31,118 crowd, while the 2017 event drew 44,127 and the 2016 attraction brought 52,347 through the turnstiles. "When I first played in one of the double-headers against the Broncos it was scary to have that many people there, most of them wanting the Broncos to win,'' Trbojevic said. "It was great to get experience of such an atmosphere when you're young. I look back at it and remember.